When I asked for cinnamon roll recommendations, my friend Kelly recommended her favorite recipe: Alton Brown’s Overnight Cinnamon Rolls. Five minutes after taking inventory to make cinnamon rolls, I poured the last of the milk into a big tall glass and bottoms up’ed. Five minutes after thinking, “I do have enough milk to make cinnamon rolls.” I swear, we’re always out of milk. Five minutes. Scatterbrain. Karma. Call it what you want. I wanted to cry. I don’t keep buttermilk around much. For most things, I’ll just use the milk+vinegar trick. I did have some heavy whipping cream, though. And for the record, cream+vinegar works in a pinch. AB’s cinnamon rolls excellent even in the face of all the little ‘accidents’ along the way… ingredients out of order, nearly forgetting an ingredient, substituting cream+ vinegar for buttermilk, and adding too much liquid to the glaze. I increased the filling on Kelly’s recommendation (I increased it by 25%). I’ll be making a second batch of these soon… judging by the gaping hole in the pan, that probably means two days. 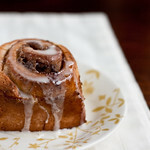 Alton Brown's popular cinnamon roll recipe is the perfect special occasion breakfast. To assemble: Butter a 9 by 13-inch glass baking dish. Turn the dough out onto a lightly floured work surface. Gently shape the dough into a rectangle with the long side nearest you. Roll into an 18 by 12-inch rectangle. Brush the dough with the 3/4-ounce of melted butter, leaving 1/2-inch border along the top edge. Sprinkle the filling mixture over the dough, leaving a 3/4-inch border along the top edge; gently press the filling into the dough. Beginning with the long edge nearest you, roll the dough into a tight cylinder. Firmly pinch the seam to seal and roll the cylinder seam side down. Very gently squeeze the cylinder to create even thickness. Using a serrated knife, slice the cylinder into 1 1/2-inch rolls; yielding 12 rolls. Arrange rolls cut side down in the baking dish; cover tightly with plastic wrap and store in the refrigerator overnight or up to 16 hours. When the oven is ready, place the rolls on the middle rack and bake until golden brown, or until the internal temperature reaches 190 degrees F on an instant-read thermometer, approximately 25-30 minutes. While the rolls are cooling slightly, make the icing by whisking the milk and powdered sugar until smooth. Spread over the rolls and serve immediately. So funny that you just posted these, I just pulled them from the oven. My husband had three! It’s my favorite way to use up the egg yolks I have left over from other recipes. Doesn’t it seems that everybody is always out of milk. These look great! I’ve made these too and had great results. Everyone loved them. Mine didn’t rise very much prior to putting them in the oven to bake but they rose up while baking. I love cinnamon rolls! I just made these last night! So funny! Sometimes I like to add some vanilla to the icing, it really gives it a great flavor! Yummy! I’ll have to try these. I hate it when I’m about to make something great and I’m missing just one ingredient that I hadn’t realized. Soooo looking forward to trying these! Had these for breakfast this morning and they were so good! I opted for a cream cheese (well, Neufchatel) frosting, mmmmm!! I love that you do it the night before!